Саундтрек к фильму Клинта Иствуда (CLINT EASTWOOD) "Как только сможешь". 1980 Warner Bros Records original pressing, made in England. 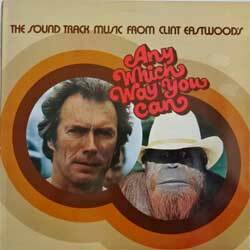 Tracks: RAY CHARLES & CLINT EASTWOOD - Beers To You, GLEN CAMPBELL - Any Which Way You Can, DAVID FRIZZELL and SHELLY WEST - You're The Reason God Made Oklahoma, FATS DOMINO - Whisley Heaven, SONDRA LOCKE - One Too Many Women In Your Life, JIM STAFFORD - Cow Patti, JOHNNY DUNCAN - Acapulco, GENE WATSON - Any Way You Want Me, THE TEXAS OPERA COMPANY - Cotton-Eyed Clint, CLIFF CROFFORD - Orangutan Hall, SONDRA LOCKE - Too Loose, JOHN DURRILL - The Good Guys And The Bad Guys. Состояние винил отличное+, конверт отличное.